The popular media have, over the past forty years, made the public aware of the existence of the UFO phenomenon; yet no serious attempt has been made by the media to present a coherent view of the basic nature of that phenomenon. That is not surprising since some of the esoteric aspects of the apparitions are outside the scope of orthodox research. You can't dump a UFO on a laboratory bench and measure its physical dimensions, and you can't make video-tapes of its activities to order. Most of the evidence for the existence of the phenomenon is what scientists call anecdotal – not fictitious, but consisting of reports of individual observers, unsupported by tangible evidence. The era of the "flying saucer" (which represents only one form of the phenomenon, but the phrase caught the public imagination and is now part of the language) began in 1948, and with it began a spontaneous campaign of confusion. The journalists were confused; scientists were confused; witnesses became confused (if they weren't already) by silly questions and ridicule. Governments and other authorities were even more confused than usual; so I don't have to tell you of the mental state of the general public – yes, you got it: they were confused. The only people in fact who weren't confused at that stage were a handful of level-headed, clear-sighted people throughout the world who recognized in the UFO phenomenon something completely outside the scope of "normal" scientific knowledge, which deserved serious investigation. Those people subscribed to the belief that the supernatural is simply the natural imperfectly understood, and they proceeded to investigate UFOs on that basis. Some, who were not adequately prepared by their backgrounds for the incredibly complex and often nebulous task, either gave up gracefully or, caught off balance by the explosion of bizarre facts and events which they uncovered, succumbed to a fantasy world and either quietly went round the bend or wrote books which made H.G. Wells and Isaac Asimov look tame. Another category of people who were not confused (in their own opinions) were some scientists who set themselves up as UFO experts. They explained away all the phenomena as temperature inversions, sun-dogs, planets, mirages, etc. without even questioning witnesses or checking actual conditions under which sightings were made. "Without waiting for me to finish the details, Dr. Menzel said: 'I ran tell you exactly what the situation was. Those two policemen were hysterical subjects.' He went on to say how they were suffering from a form of delusion... I asked him how long he had talked to the patrolmen, how far he had dug into their records and background as I had done. He didn't even know their names, and had spent no time in Exeter at all. About the photograph, he said: 'This is obviously a double exposure.' Yet he didn't know who the photographer was, had not examined the negative or talked to the expert photographers who had. When I asked him about the 60 other sightings at Exeter, he slammed his hand down on the table and said: 'Will you shut up! I didn't come here to go through an inquisition!'" We shall not get any solid answers from orthodox scientists because even when they are sincere, they are out of their depth. The dedicated, monodisciplinary scientist is notoriously naive when he steps outside his special field. Edison said the phonograph was not of any commercial value and that the use of alternating current was unjustified. Lord Kelvin said that X-rays would prove to be a hoax, that radio had no future, and that heavier-than-air craft were impossible. One Astronomer Royal (Prof. Richard Woolley) said that talk of space travel was utter bilge; another (Sir Harold Spencer Jones) that man would never set his foot on the moon. Perhaps the worst interviewers in UFO investigation, unless they are UFO specialists, are journalists. They have no idea of what questions to ask, nor how to handle and analyze the answers – and why should they? Their function is to publish a story, as dramatic and sensational as possible. That is why the public have for 40 years been the target, of uncounted thousands of stories of mysterious lights, of saucer-shaped objects seen moving in erratic paths across the sky, of landings of unknown craft and even the appearance of beings presumed to come from outer space. Those front-page stories never have any satisfactory follow-up, no final explanation (other than the fatuous theories of experts in some other field than the UFO phenomenon, usually in defiance of the reported facts) because that's not how the media work. Their function ends with the publication of the report, however incomplete. Nor is it the function of the police to investigate UFO reports beyond a routine check for illegal actions, physical injuries or property damage if appropriate. Yet, for some reason, most of the more spectacular UFO reports were made in the first instance to the nearest police station. Surely they have enough headaches trying to catch criminals, find stolen vehicles and generally keeping the peace without being lumbered with reports of incidents which have taxed the efforts of specialists for decades. What about the Air Forces? By definition, they are the organizations best suited to an investigation of Unidentified Flying Objects, and the term itself apparently originated with the USAF. To the Press and the public, the phenomena were flying saucers. A UFO, officially, is any object in the sky (an aircraft, a balloon, a flock of birds or anything else) which has been seen, visually or on radar, but not positively identified. As soon as it is found to be an airliner or a weather balloon, it is no longer a UFO. There are two main reasons for the interest of an Air Force in UFOs: they may be a danger to air navigation (e.g. a private plane off course), or they may be a threat to the national security (a bomber from a hostile neighbour trying on a provocative raid). The reason for having an Air Force is to deal with such situations if they exceed the scope of the civil authority. Unfortunately an Air Force is a military organization, and as soon as anything enters the military sphere it becomes subject to "security" as a matter of course. Any information connected, however remotely, with military matters is automatically classified. So we have the ludicrous situation that because a flying saucer might – just might – be an emissary of Big Brother with a bomb-bay full of nuclear nasties, its very existence must be a military secret even if the UFO proves to be merely a spaceship from Mars full of little green men and no threat to anybody. In fact the investigation by Charles Berlitz of the Roswell Incident (reported in his book of the same name, published by Granada) suggests that "men from Mars", of any colour, rate the highest security classification of all. Commonsense would suggest that once the UFO was established to be not Big Brother in an expansionist or vindictive mood, the fact could be published to a relieved population with all details. Not so. The late Frank Scully, who wrote one of the first books on flying saucers ever published ("Behind the Flying Saucers", Gollancz, 1950), summed up the situation with this quotation: "The military must always have a secret. It will give up this one when it gets a better one." No one disputes the need for reasonable military secrecy even in peacetime. There is no justification for a "security" ban imposed on information which is non-military, particularly when civilians are the subjects of the bans. Investigation of several important South Australian incidents in my files has reached a dead end because witnesses were silenced by authorities. It does not require much pressure to scare the daylights out of a witness who is already quaking after being buzzed by a mysterious light or some such phenomenon, by warning him or her not to talk about the experience because "security is involved". This is of course one of those big lies which succeed when little white lies fail. Those techniques worked successfully in the early days to take the heat off UFO reports which embarrassed officious authorities. Now however a more-subtle means is available to ensure that witnesses do not talk about something which authorities can't explain and don't understand. In the case of the Knowles family, who reported a UFO incident near the West Australian border in January, 1988, they were silenced by the media. One of the TV stations put them under a contract, for a financial consideration, to give the station exclusive rights to the story. This meant that the witnesses could not talk to researchers or anyone else. The witnesses were then set up in a row in front of TV cameras and interviewed, without eliciting any information of value to researchers. The reaction of the average viewer was to yawn, comment that it was all a lot of hooey, and switch to the nearest soapie. A more effective way of killing a story has not yet been invented. It was even more effective than the traditional technique, also employed in the Knowles case, of asking "experts" to explain the phenomenon. Competent researchers throughout the world who are experienced in interviewing people who report UFO sightings have built up an impressive body of facts and data which give an increasingly rounded picture of the phenomena. This is done by analyzing reports from eye-witnesses obtained without pressure, harassment or financial inducement – particularly the latter. It is obvious that UFO phenomena do not respond to orthodox physical examination. Photographs have been studied; marks on the ground have been tested for radioactivity; soil samples have been analyzed; and so on. At best the results have been inconclusive. The conclusion is that the phenomena are not entirely confined to the physical plane, and do not obey physical laws as we understand them. They are extra-dimensional phenomena: that is, although they manifest, at least partly, on our physical plane of matter, they originate on another plane, dimension, or rate of vibration. Some researchers have pursued this hypothesis from the earliest days. An outstanding exponent of the extra-dimensional theories was the late Dr. Meade Layne, who published a book entitled "The Ether Ship Mystery" (Borderland Sciences Research Assn., 1955). Parallels between UFO phenomena and psychic phenomena have been noted and commented on for many years but those aspects were submerged by the "spaceship and alien" school of thought, on one hand, and the "atmospheric phenomena" school on the other. In his book "They Rode in Space Ships", Gavin Gibbons sets out the hypothesis that "people" from other dimensions and their activities are what we call "spirits". Not only people, he says, but whole stars with their attendant planets either too heavy or too light to be perceptible by our senses or instruments can well exist all-over the Universe. Under certain conditions, these people and their activities could manifest on what we call the physical plane and be observed in our own physical space-time frame. Our knowledge of such possibilities is in its infancy but in time our understanding must improve, and what is at present regarded as mysteries will become common knowledge. After 38 years in meteorology I have strong views on the subject of unidentified flying objects (UFOs) which, as a name, is quite misleading, as most of them have been identified. Popular use has changed the meaning of the term to refer mainly to extra terrestrial visitations. Some Ufologists – workers in the field of Ufology – started with the extra-terrestrial hypothesis (ETH) but became increasingly disenchanted with it. We now have a new breed of Ufologists who believe that UFOs are "metaphysical", "supernatural" or "interdimensional" instead of extra-terrestrial space craft. Most UFO evidence is of the eyewitness kind. Most people are not aware of the unreliable nature of such evidence. When a number of observers witness an unexpected, dramatic or startling event, there are usually considerable differences in their reports. The more time witnesses have to think over and talk about what they have seen, the less accurate their memories become. Sightings, like wine, improve with age. So it is important to get the details quickly. Psychologists have shown that the reliability of witnesses is not dependent on socio-economic status or on the confidence of the observer. A university education, a respectable career or training as a pilot is no guarantee of reliability when observing a startling event. An observer is also less accurate in reporting when under stress. 1. The autokinetic effect – apparent movement of objects which are known to be stationary. 2. After images – a retinal image which persists after the retina has been exposed to a light which is no longer seen. What the eye sees is also affected by what the brain tells you you ought to see. Members of the Loch Ness Investigation team who believed in the existence of the monster photographed what they thought were "humps Ploughing through the water". However, the developed photographs showed no humps but only a slight wake in the water. 1. Radar – especially anomalous propagation and angels. 2. Astronomy – how the appearance of the moon, planets and meteors can deceive. 3. Meteorology – particularly meteorological optics. 4. Space Technology – particularly regarding re-entry into the atmosphere. 5. Psychology – why hoaxes are perpetrated. 6. Geology piezoelectric effects with earth tremors in mineral or quartz rocks. 7. Ornithology – how flocks of birds have been called UFOs. 8. Entomology – the origin of Angel Hair and the types of insects which build circular nests. 9. Botany – growth of fungi in circles. 10. Veterinary Science – re mutilations and unusual marks on cattle. Lenticular clouds – grey, lens-shaped and sometimes laminar in appearance. They can remain stationary when other clouds are moving – which has confused some Ufologists. Mother of pearl clouds – caused by the sun shining on fine ice clouds in the stratosphere up to a few hours after sunset. Noctilucent clouds – the sun shining on meteoric dust high in the stratosphere, again up to a few hours after sunset. Their apparent rapid movement, as the sun sinks further below the horizon, is suggestive of space travel. St Elmo's Fire – commonly forms on the leading edges of ships or aircraft as they move through an electric field. A Pillar of Fire is a form of St Elmo's Fire caused by dust particles in dry areas. Lightning – Ball Lightning is a rare form of lightning which floats slowly as a small red or orange ball and leaves a burnt ring when it hits the ground. Haloes – refraction of light through ice crystal clouds. Small sections look silvery white. Corona – diffraction through fine water droplets. Segments of these are called irridescent clouds. Again small sections look like UFOs. Glory – coloured circles round the shadow of an object e.g. around the shadow of a plane on underlying clouds. Scintillation – the apparent changes of size, shape, position and colour of objects caused by the refraction of light through air of differing densities. Auroras – radiative emission from nitrogen and other molecules during magnetic storms. Auroras take on many dramatic forms such as curtains, searchlights, ladders and fireworks. The most easily confused is the auroral meteor. Mirages – due to refraction light waves are bent upwards when steep lapse rates exist and bent downwards when marked inversions (temperature increases with height) exist. We are all familiar with the former type of mirage e.g. water on the road on a hot day. The latter type gives rise to objects on the, ground or over the horizon appearing to be in the sky. Surface inversions can occur on clear, calm, cold nights and can produce a variety of localised mirages e.g. trains, ships or semitrailers in the sky. A widespread inversion, such as the subsidence inversion in marked ridges of high pressure, can extend for hundreds and sometimes thousands of kilometres. When this occurs super-refraction enables light waves to be bent round the earth's surface for remarkable distances. Objects have been identified from sea level at distances of 1000km, even further from an aircraft, as the atmosphere acts as a magnifying lens at this time. The Flying Dutchman (a ghostly sailing ship) was this type of mirage. The best Australian example of a night-time mirage would be the Min-Min lights of NW Queensland. These are caused by refraction of lights from motor vehicles which could be up to 150km away. Parhelia, mock suns, sun dogs, sun pillars, the green flash and crepuscular rays. Under certain circumstances the planets and stars can take on unusual appearances. Even a scientifically trained naval officer who later became President of USA (Jimmy Carter) mistook Venus for a UFO. During World War 2, US gunners tried to shoot down Venus (thankfully without success). Meteors, material bodies which enter earth's atmosphere from outer space, are called "shooting stars" when they are faint, but the brighter ones are bolides or fireballs. Bright meteors are spectacular when viewed from a plane. The pilot generally concludes that the meteor is very near or about to hit the aircraft when in fact it may be 150km away. Meteors sometimes move quite slowly (10km per sec) and on rare occasions have been observed for 2 or 3 minutes. They usually look like a grey wingless aircraft with green colouring. Satellites – there are over 5200 man-made objects circling the earth. Their entry into the atmosphere is usually fiery with long smoke trails. Balloons – the 6-hourly release of meteorological balloons from 50 sites in Australia provides a frequent cause for confusion. Larger research balloons (Hibal & Ghost Balloons for example) give rise to a spate of UFO reports as some are as tall as a 10 storey building. Winds in the upper air usually differ from the surface wind, a fact which often leads to confusion in identification as it appears that the light is being propelled against the wind. False echoes or 'angels' occur even with the most modern radar equipment. Radar waves are subject to the same refraction and reflection conditions as light waves and may be bent round the earth's surface to produce radar mirages. Sharp temperature and humidity discontinuities, typical of widespread subsidence inversions, set up what is known as radar ducting. For example, a cruiser using radar in the Mediterranean during World War 2 reported sinking a target that later proved to be a false image of Malta which at the time was well beyond normal radar range. Single or multiple reflection of radar waves from other reflection surfaces can give rise to ghosting. For example, a plane approaching an airport can have a ghost image flying behind it, often at twice the speed, but the ghost disappears when the plane lands. Ufologists often give the most weight to radar as evidence for the existence of UFOs, but they ignore the known limitations of radar. When there is no visual sighting to confirm the radar echo they claim the UFO is able to make itself invisible. When there is no radar echo to confirm a visual sighting, often the case with optical phenomena, they say the UFO has made itself invisible to radar. Official UFO records were maintained in Australia by the RAAF for 12 years and in USA by the US Air Force for 22 years. 97% of cases were identified as natural or man-made phenomena. Of the remaining 3%, some were unidentifiable because of lack of data such as date or time. Some were hoaxes by people who like to spin tall tales, delight in fooling the news media, or who want to become instant celebrities. Both the RAAF and the US Air Force have discontinued their official surveys as they see no value in continuing them. 1. No unidentified flying objects reported, investigated and evaluated by the Air Force have ever given any indication of threat to national security. 2. There has been no evidence submitted to or discovered by the Air Force that sightings categorized as unidentified represent technological developments or principles beyond the range of present-day scientific knowledge. 3. No evidence indicates that sightings categorized as unidentified are extra-terrestrial vehicles. Often the photographer comments that "he didn't see anything unusual at the time" when saucer-like objects appear on the developed photograph. Processing defects can also occur; a drop of a chemical or a crease in the film can easily give rise to unexpected objects on a photograph. Unexpected luminous objects on a photograph are usually caused by a lens flare. These happen when a very bright light (the sun or a studio light) is reflected several times off the different elements inside the lens. You can see examples of lens flare on your TV screen. It is easy to create fake UFO photographs and many have been identified as such. Of all the thousands of "genuine" UFO photographs there is not one that shows a clear, unambiguous, flying saucer. Most show only a blip, dot, blur or line. 1. By quoting only conclusion '1' of Project Blue Book the impression is given that the official view is "they are there but they are friendly". 2. Scientists have closed minds. The example often quoted is of the French Academy of Science disbelieving reports about stones falling from the sky. However, the French Academy reversed its decision within 30 years when stones from many areas were analysed, i.e. when hard evidence became available. 3. The unidentified 3% of cases is used as evidence for extra-terrestrial visitation. 4. The onus of proof is shifted to the negative side. It is well nigh impossible to scientifically prove that something does not exist. 5. Governments and officials are covering up. Of the 80,000 pages of UFO material released in the USA after the Freedom of Information law was passed only 176 pages (0.2%) are restricted. 176 pages from a Government Dept. in 30 years is a very insignificant amount if it dealt with earth shattering news like space men landing in USA. The truth is that this part of the material is restricted because it contains some agents' names. Hundreds of people throughout the world have claimed to be abducted by UFOs. Most were in USA. A few claim to have been abducted up to 4 times. Not one has passed an independent polygraphic (lie detector) test. Not one of the US cases has reported their abduction to the FBI which has a penalty of $10,000 or 3 years gaol for false claims of this type. The reports are invariably given to the news media. Ufologists argue that the veracity of their claims is supported by hypnosis, yet psychiatrists say that people can lie under hypnosis and relive fantasies. Note that hypnosis is not used in law courts for obtaining the truth! 1. The news media give publicity to sightings and little publicity to explanations. 2. The flood of UFO books. Very few of these have any scientific content and most are completely subjective. Explanatory books in libraries are scarce. In fact, they cannot be bought off the shelf but have to be ordered. 3. Lack of knowledge of the wonders of our atmosphere and their bizarre effects. 4. The prize monies offered by news media in USA. 5. TV and some films divorce people (especially children) from reality. 1. Nocturnal lights. There are many causes for unusual lights at night, or even during the day. 2. Unusual movement of lights. Rapid changes of speed or direction. This is typical of optical phenomena, especially when the observer is moving. 3. Radar echoes. Radar literature contains many examples of anomalous propagation, angels or ghosts. 4. Marks on the ground. Some insects and fungi cause circular marks on the ground. Ball lightning can leave a burnt circle. Small vortices can leave a circular pattern of damage. 5. Alleged abductions. No 'abductees' have passed an independent lie-detector test. Many have relived their stories under hypnosis. 6. Stalled vehicles. Motor mechanics know of many causes for vehicles to stall. 7. Mutilated cattle. There have been no cases of a veterinary pathologist being unable to explain markings on cattle. 8. Earth tremors. Geologists tell us the piezo-electric lights are cause by some earth tremors. The lights (UFOs) do not cause the tremors. This type of evidence would not be acceptable in a court of law. Since 1947, when the name "UFO" was invented, there has not been one shred of hard evidence to support the claim that they are anything more than natural phenomena or man-made objects. In literally millions of weather observations, I know of only one case which included a supposed UFO. Parhelia, mirages, mock suns, haloes and ball lightning are all included in the observational records. But UFOs are conspicuous by their absence. Ships' officers throughout the world keep a trained watch on the skies. They too see many optical phenomena but very few UFOs! The magazine The Marine Observer gives hundreds of natural examples. Other professional "sky watchers", such as the astronomers at Mt Stromlo Observatory, have also concluded that although some sightings may be bizarre and unusual, there is nothing in all the thousands of reports to support Ufologists' claims. In Mr. Brunt's article "Understanding UFOs" he says the name Unidentified Flying Objects is misleading because most of them have been identified. However once identified the phenomena cease to be UFOs and we are no longer concerned with them. It is true that a large percentage of reported cases are in fact misidentifications of meteorological phenomena. All Mr. Brunt has done is to show how easy it is to eliminate those, which means that there is a significant residue of true "unknowns" and it is those which concern the UFO researcher. 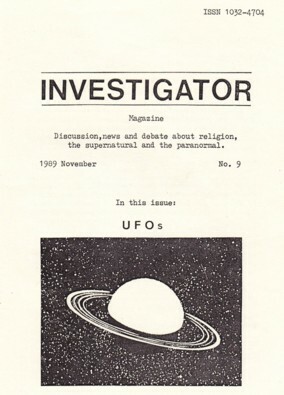 More than 30 years ago the Australian Flying Saucer Research Society publicised, through the media and public meetings, the importance of checking UFO sightings to eliminate atmospheric and astronomical phenomena, stressing almost all the possibilities covered in the article and a few more. I must take issue with Mr. Brunt's statement that "When a number of observers witness an ... event, there are usually considerable differences in their reports". This is not true, as at least two cases show. In one case a lighted balloon was launched across a large American city as an experiment to gauge public reaction. The reports came in – and the vast majority reported accurately a lighted object moving in a certain direction and speed at a certain time. In another case, a large piece of space junk passed over Britain in re-entering the atmosphere, seen as a glowing, meteor-like object. This provoked hundreds of reports which were subsequently checked. The vast majority again reported accurately times, distances, angles and appearance. There were no reports of dragons or little green men. As a result of information supplied by ordinary witnesses, the trajectory of the object was plotted with great accuracy. In other words, the majority of witnesses report just exactly what they saw. It is of course a time-worn ploy to attack the character or competence of witnesses. In a court of law, such a ploy may result in the jury being made free of the accused's record of previous convictions. As a rough parallel to this legal convention, may I point out that the book "The UFO Enigma" was written by Dr. Donald Menzel, sometime Professor of Astrophysics at Harvard. In the early days of UFO research, Dr. Menzel rushed into print with a book "explaining" every UFO sighting as parhelia, mock suns, sun dogs, sun pillars, planets, meteors, etc. Unfortunately for this learned gentleman, the U.S. Air Force refused to accept Dr. Menzel's explanations of their UFOs. I don't think that Bible students were overjoyed by his "explanation" of Ezekiel's visions, either. I have already dealt with Dr. Menzel's methods of investigating UFO sightings [Investigator No.1, pp. 38-39). For Mr. Brunt to recommend Dr. Menzel's books because they support his own convictions is therefore not so much biased as reprehensible. Air force "surveys" of UFO activity and their reports cannot be taken at face value. The reports which have been issued by the USAF and the RAAF – to mention only two – are highly unreliable and misleading. They have consistently omitted or covered up crucial evidence. Mr. Brunt has probably never read - he certainly hasn't recommended – one of the best and most authoritative books on UFOs ever written, "The Report on Unidentified Flying Objects", by Capt. Ed Ruppelt, who was formerly head of "Project Blue Book". The official Report on that project which Mr. Brunt quotes was a pathetic whitewash job from which, as responsible personnel testified, all significant cases were excluded. Mr. Brunt's quotations therefore are completely inadequate. Another researcher whom Mr. Brunt does not mention is Donald Keyhoe who has written several relevant books. The record of the RAAF in UFO public relations is deplorable. I have on file official statements on the subject which are in flat contradiction of each other, so their public pronouncements must be taken with a spoonful of salt. Mr. Brunt does not even hint in his discussion of witnesses that some of the most significant evidence has never been published, because the witnesses were officially silenced. Why should security officers order a witness not to talk about a sighting, as has happened many times, if the UFO is a natural phenomenon? Space does not permit me to detail those cases here, but Mr. Brunt is deceiving himself if he thinks any FOI Act will flush out the official files in such cases. You can't ask for information unless you know what document to ask for, and all government departments have a machine called a shredder. And how can FOI legislation provide information on cases which, for very good reasons, were not documented? I could quote three or four cases in South Australia alone where my investigation of witnesses was blocked by official action – very strange if the phenomenon was only a temperature inversion or Venus. That is peanuts compared with alleged cover-ups in the U.S.A. I could write much more in criticism of Mr. Brunt's superficial and unoriginal approach to the subject, exemplified by his "Conclusions" (evidence for and against). We all know that "there are many causes for unusual lights..." Because Socrates is a man, and I am a man, that doesn't mean that I am Socrates. Or, because a meteor is a light moving across the sky, and a UFO is a light moving across the sky, is a UFO therefore a meteor? I would like to thank Mr Thomas for his comments. I do think that the exchange of views like this a good way to advance our knowledge of any subject. I will attempt to answer the points he raises, in sequential order. Mr Thomas places stress on the residue, of "unknowns" after the 97% of identifieds have been eliminated from all the UFO data. In my experience, the "unknowns" are because of lack of information or errors in identification. When all the information becomes available they usually become part of the identified list. In any accumulation of data, you usually get a certain amount of what scientists call "noise" and this applies to the many, thousands of supposed UFO sightings. In other words, the identified cases and the unknown cases are all a part of the same statistical population and it is largely due to lack of information or observer misidentification that causes are regarded as "unknown". If Mr Thomas could prove that they come from a different population, then he would have a case. The Australian Flying Saucer Research Society's publicity about eliminating atmospheric and astronomical phenomena cannot be effective because the general public does not always recognise unusual phenomena of this type. I know of dozens of cases where meteorological effects have not been eliminated from supposedly "classical UFO cases", for example, the Nullarbor incidents last year. With regard to the reliability of witnesses, the two cases Mr Thomas quoted do not prove their reliability. For every case I know of where the testimony was exact, I have dozens which demonstrate observer fallibility. In no way was I attacking the character or the competence of witnesses. I simply wanted to point out that that when something strange and sudden occurs outside one's normal experience, there is a general tendency for unreliability in observing and reporting. Over a 10-year period I had the experience of debriefing airline pilots (and they would be better observers than most) and have found many cases of their misidentification of unusual phenomena. Psychologists have conducted many experiments with people watching simulated crimes or muggings and have found observing errors. Unfortunately, Ufology is long on eyewitness testimony and short on hard evidence. It is significant that Project Blue Book lists many examples of deficiency in eyewitness testimonies. The weight of evidence on all UFO data that I have seen leans towards the unreliability of eyewitness accounts, especially when it concerns sudden and unusual phenomena. I am not sure about the relevance of attacking Dr. Manzel as a UFO writer. He was one of the first to bring a bit of science into the subject. I, like Dr. Menzel, never thought that meteorological phenomena could explain all UFO sightings. Scientists have been reluctant to spend time researching Ufology because there are no Nobel Prizes or awards given for proving that something is not there. It is only when astronomers, meteorologists, geologists, physicists, entomologists and psychologists pool their respective knowledge about UFO claims that it becomes obvious there is no substance in them. As for Dr. Menzel's explanation of Ezekiel’s vision in the Bible (Ezekiel 1:15-21), saying it was very much like the St. Petersberg phenomenon, I thought this would have greatly encouraged Bible students. The Bible teaches that God is the God of all nature and indeed many unusual phenomena recorded in the Bible have, in the light of later knowledge, been shown to be "naturally" occurring. The fact that the Bible writers gave accurate descriptions of unusual phenomena, which are now known helps to confirm the reliability of the record; it does not undermine it. The miracle is not that they occurred, but that these unusual things occurred at the right place and the right time. Other examples are the pillar of fire, St. Elmos's fire and the Red Sea crossing. Mr Thomas claims that the RAAF, the US Air Force, Project Blue Book, and numerous officials have covered up crucial evidence and witnesses have been officially silenced. I can't counter this except to say I'd like to see the evidence for it and to ask why they would want to do it. I have had nothing but cooperation and assistance in my dealings with the RAAF on this matter. Letter to the editor of The Advertiser 1989 July 22. REFER to the front-page article (The Advertiser, 13/7/89) about the unusual markings on Lake Eyre, photographed by Jeff Findley some 10 years ago. Most people have beard of the larger vortices in the atmosphere, such as tornadoes and waterspouts but few seem to be aware that small-scale vortices can descend and touch the ground for a few seconds, leaving damage in very symmetrical circles or rings. The spinning winds in the vortex exert a very powerful downward thrust which Is converted to a spiralling outward thrust when it touches the ground. The most common ground evidence of them types of vortices would be small flattened circles in wheat fields, usually 2m to 5m across. A feature s the sharp boundary of damage, with the crop completely undamaged outside. Sometimes multiple circles occur, but some of the larger damage areas are in the form of rings which can be up to 100m in diameter. I, too, saw the recent TV program on the symmetrical markings in an English cornfield. These were typical of the many British examples recorded by the Tornado and Storm Research Organization, Bradford-on-Avon, Wiltshire. With the denser population in Britain, they have instances of vortices being observed in action and are able to inspect the damage immediately afterwards. We have such circles and rings In Australia, as many a farmer can verify. Because there are no footsteps or other marks immediately outside the damage area, these circles provide wonderful material for ufologists. The famous "UFO nests" in the Tully area of North Queensland (some in long grasses even under water) exhibit nothing more than vortex-caused damage. UFO WAS ONLY THE RUSSIANS! MELBOURNE, Today: Those lights in the sky on Tuesday night...flying saucer? Little green men from Mars? No, it was just the Russians! At least, that's the Air Force's explanation of reports of an unidentified object flashing north-south across the sky between Echuca and Melbourne. An RAAF spokesman said it was probably the Russian satellite Cosmos-526. "It was launched in October fast year and we calculated it would re-enter the earth's atmosphere between April 3 and 10 this year," the official said. This was the RAAF's 686th UFO investigation since 1960. "Since 1960 we have seriously investigated every UFO report in Australia," the official said. "We can say that we have explained 93 per cent of all reports. "Six per cent are not identified because of lack of details. The other 1 per cent...well, we put it down to causes unknown," the official said.